The outside of your home should be as attractive as it is functional, with the same amount of attention spent on the decor that the interior enjoys. One easy way to make the exterior of your home look instantly appealing is the addition of a spiral staircase, providing functional elegance. Here are just a few reasons why a spiral staircase could add real value to the outside of your home. Many people are drawn to spiral staircases because of their appearance, a far more attractive addition to any home than just the standard design. However, a spiral staircase is also practical too, taking up far less room than traditional types of staircases without compromising on stability or safety. This means that you’ll be able to fit a staircase into areas where it may not otherwise have been possible without gobbling up valuable yard space below. 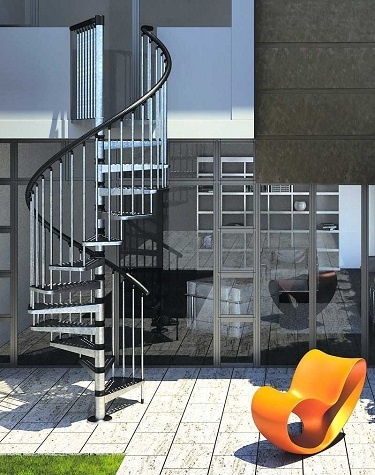 The Gamia Zinc 1600mm is an exterior spiral staircase kit which is perfect for more compact locations such as courtyards or small gardens, giving you the opportunity to have a stunning spiral staircase even when space is at a premium. There’s no denying that a spiral staircase adds a touch of flair to the outside of your home that cannot easily be achieved in any other way. The flowing, curved lines of the spiral are a piece of outstanding architectural engineering, yet are surprisingly easy to install. The spectacular Neptune Spiral Staircase comes in a variety of powder coated finishes, including black, silver grey and white and incorporates two gentle turns for the maximum effect. It’s versatile too and can be used to either link up to an external door or a balcony, allowing you to create the perfect design for your home. Spiral staircases don’t have to be difficult to install, and there’s a range of exterior spiral staircase kits which can be purchased for self-assembly. 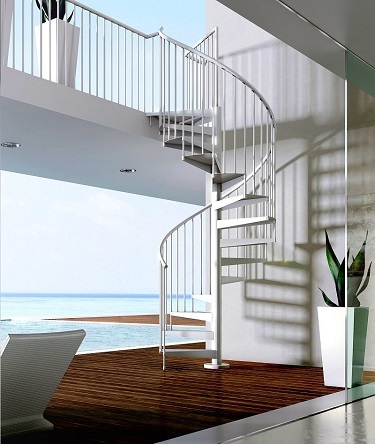 Models start from just £832 (excluding VAT) for the Civik Zink so you don’t have to break the bank to get an outstanding spiral staircase which could transform the exterior of your home. You don’t need to compromise on quality to get an economical design which complements your home, and comes with a 10 year guarantee as standard. Why not take a look today at our range of exterior spiral stair kits to see how you could give your home the external makeover that it deserves?